many significant buildings over the years, we have fewer heritage protected buildings than any other part of Auckland, there is paucity of heritage signage in place, and a very senior Roskill councillor was once quoted as saying “Roskill has no heritage”. Led the upgrade of St Andrews Reserve, ‘the home of local government in Auckland’ including heritage interpretive signage. Secured funding for the installation of heritage interpretive signage around Roskill and ran a public vote to determine the priority sites. Installation commencing in late 2013. Initiated and delivered the Suffrage Memorial in the Rose Gardens (corner Mt Albert Rd & Warren Ave), to be formally unveiled on September 19. And then there’s the work of the wonderful Mt Roskill (Puketapapa) Historical Society, led by Garth Houltam. The Society was only formed in 2011 but has done a power of work to get heritage on to the local agenda, and provide the Local Board with good information. 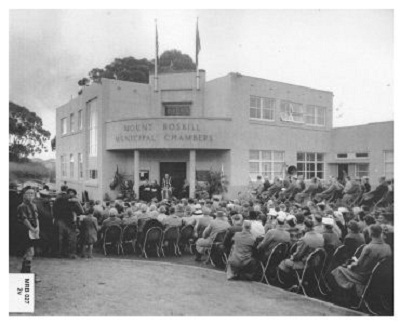 Finally, we are thrilled that the community campaign initiated by the Historical Society and supported by the Local Board to save the historic Mt Roskill Council Chambers has succeeded. A delegation of Board representatives including Julie and Michael spoke to the Strategy & Finance Committee of Council on Friday and received the thumbs up for a $3.6 million restoration plan that will see the original 1957 building restored. This came on the back of a 1000 strong petition from the Historical Society. A great win to cap off a great term for Heritage in Roskill! We are taking a comprehensive policy on local heritage issues into the 2013 election which can be viewed here.